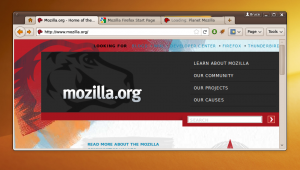 Is Firefox 4 copying the Google Chrome looks? The Menubar has been hidden and replaced with Page and Tools drop down menu. No doubt the above changes looks interesting and are sure to make more screenspace available to the user. But does it look vaguely familiar? Yes, it does look very similar to Google Chrome. Is this a result of the guys at Mozilla feeling the heat from Google Chrome? Maybe. But the the main deciding factor, I feel, will be functionalities and speed. While there are already talks about Mozilla Weave making an appearence in Firefox 4, it will be interesting to see what other new features and improvements will be incorporated in Firefox 4.